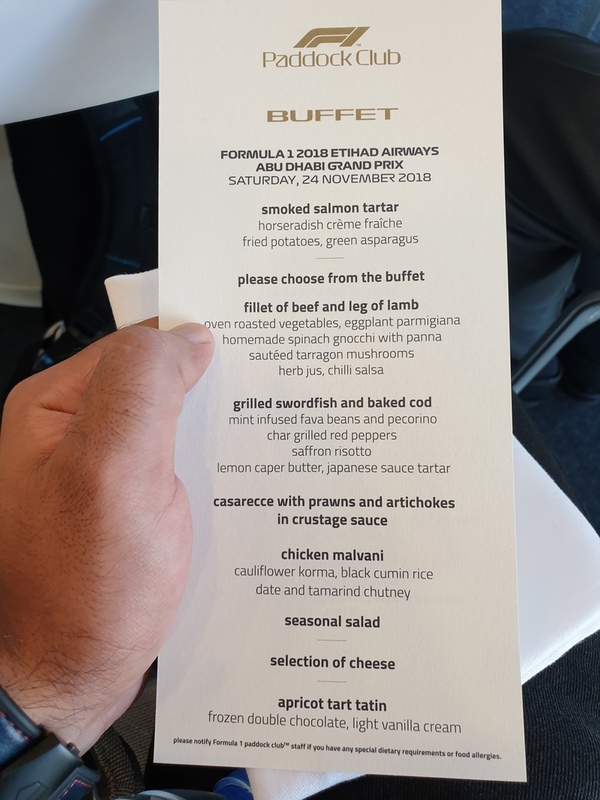 The last day of the 2018 F1 Season ﻿had finally arrived. 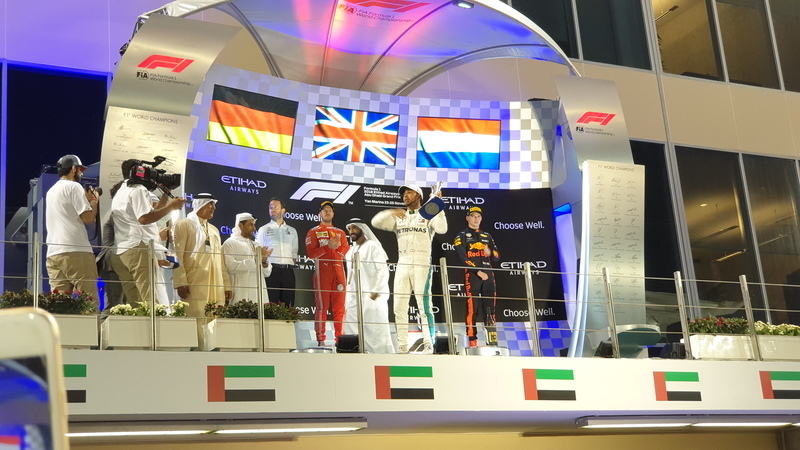 The Championships were decided, however there was still a race to be won. Everyone was really excited about the Sunday. The Season ender is really a spectacle to behold. Everyone was looking forward to seeing their families again, enjoying the winter break and spending Christmas and New Year. There were farewells as well with some moving on to greener pastures while some taking a sabbatical from the sport. 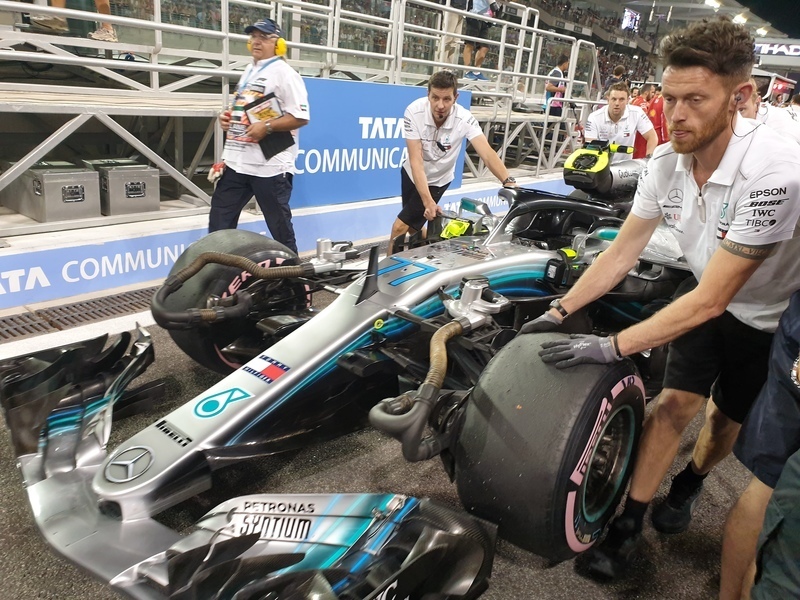 This would be the last time we would see ﻿Fernando Alonso ﻿in a ﻿F1 Car ( probably ). 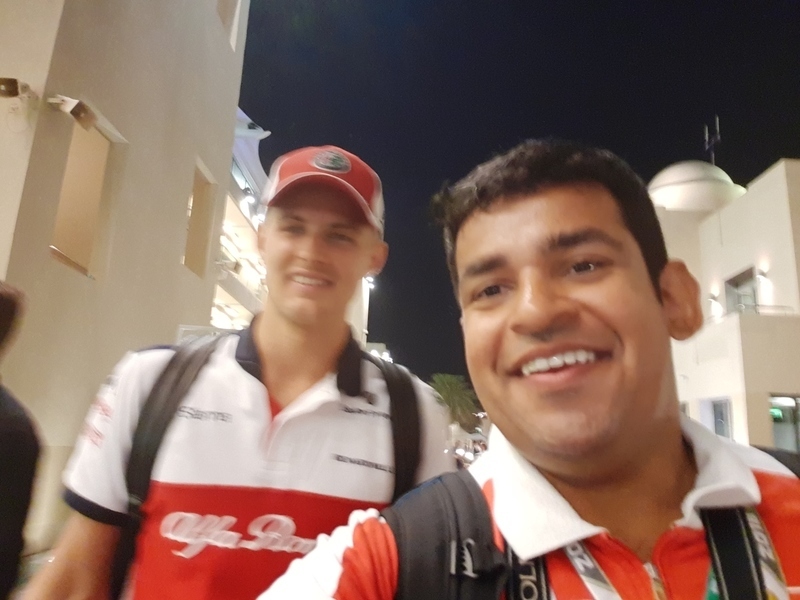 Marcus Ericsson, Esteban Ocon, Brendan Hartley, Sergei Sirotkin, Stoffel Vandoorne ﻿would also not feature on the 2019 grid. 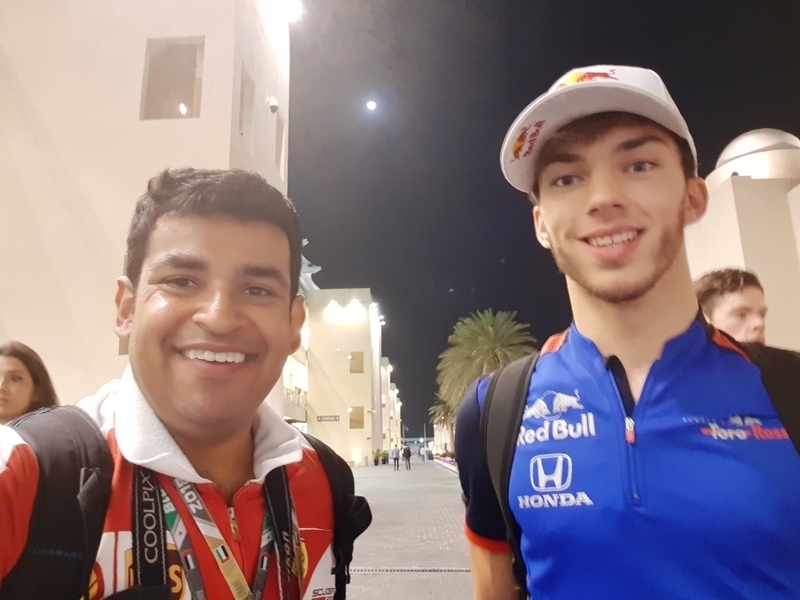 ﻿Pierre Gasly ﻿would race for the last time for ﻿Toro Rosso, Charles LeClerc for Sauber & Kimi Raikkonen for Ferrari likewise. 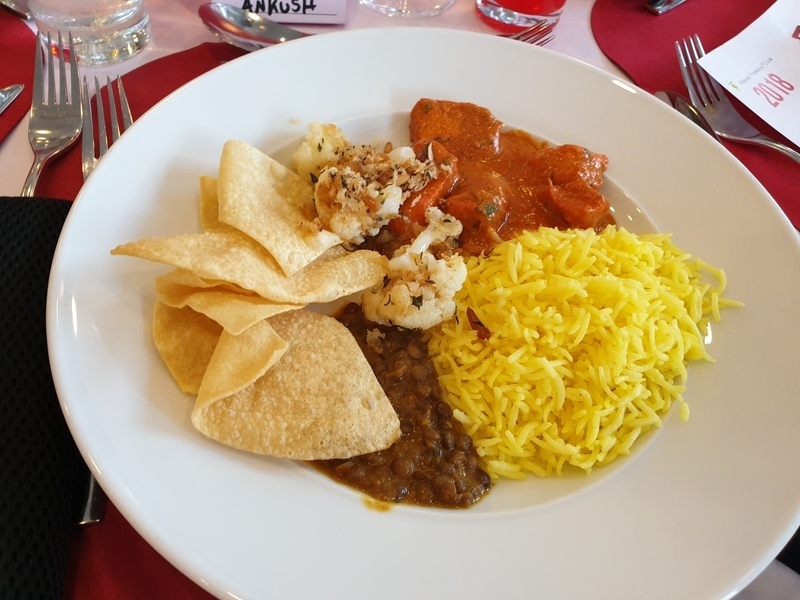 A lot happened over a Sunday..a lot..time to relive that day! 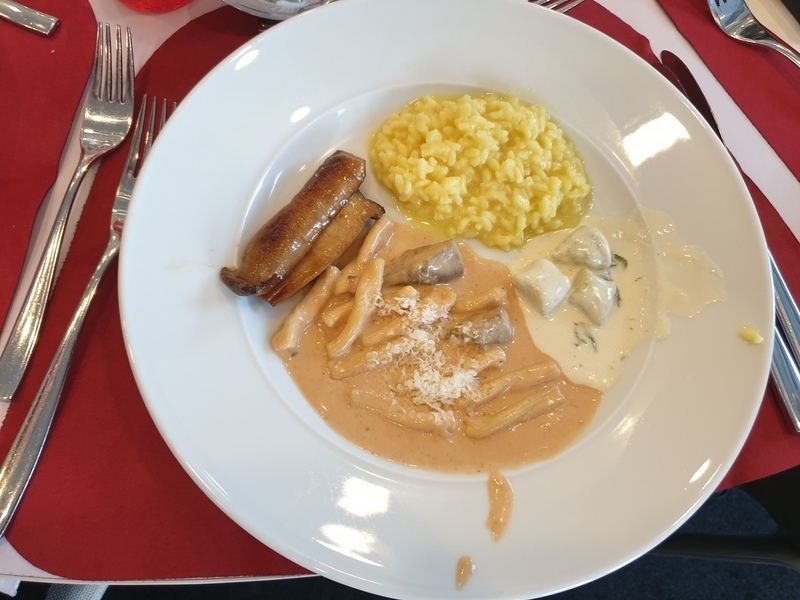 Food, food and some Mousse!! 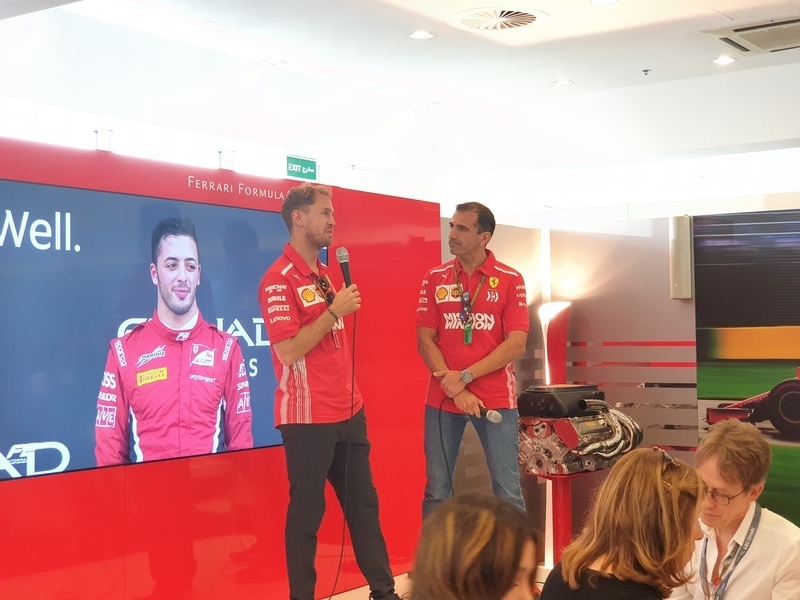 ﻿Sebastian Vettel ﻿was the driver guest for Sunday and the team principal would follow shortly after. 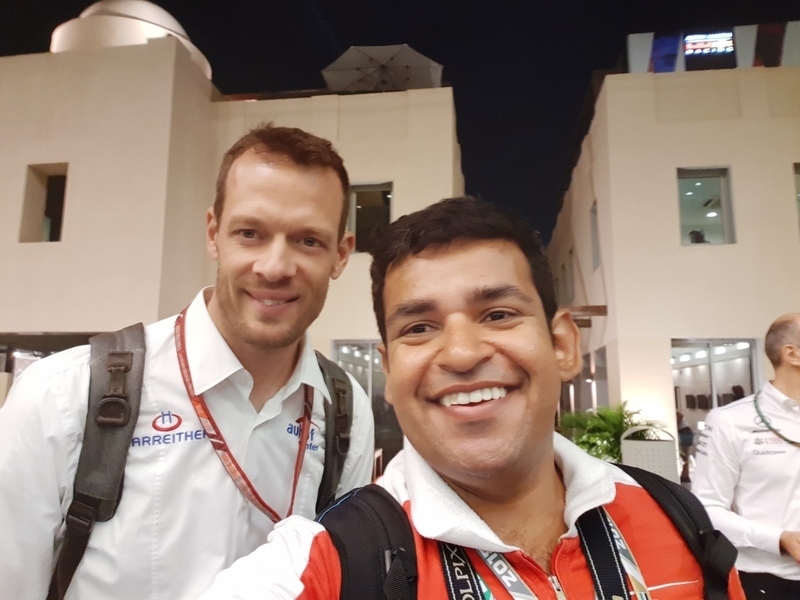 ﻿Sebastian Vettel ﻿looking forward to a good race and an even better winter break! 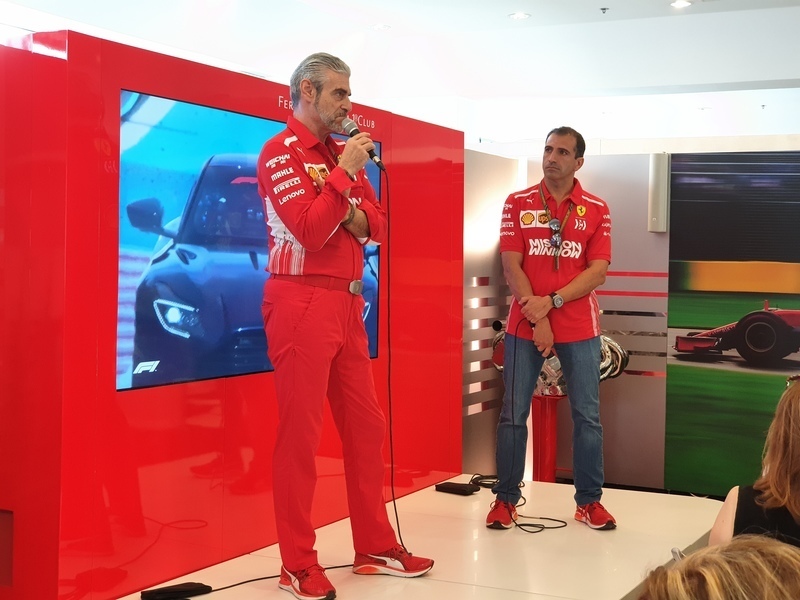 ﻿Maurizio Arrivabene, the Team Principal ﻿joined us shortly after ﻿Seb ﻿left and he was at his talkative best! Bless him. My dear friend being honoured for her loyalty and love for the team. 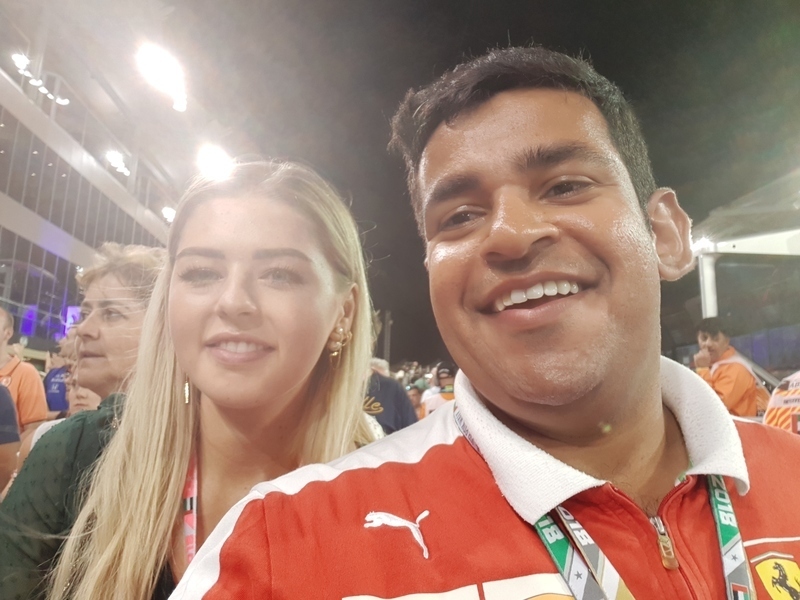 She attended 14 Races in 2018!! Quite a feat! 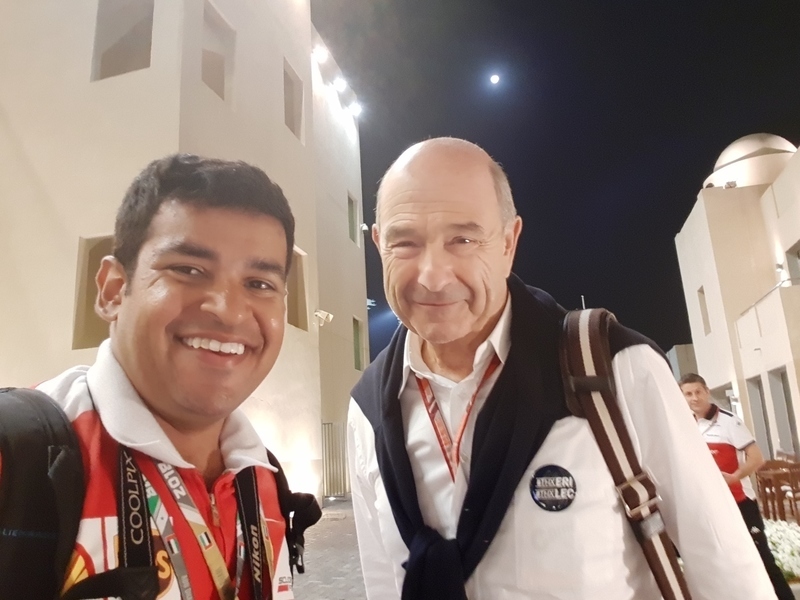 My Friend and our ﻿Do&Co ( the Hospitality partner in F1 ) Host Nil Mas ﻿saying goodbye to the World of F1 and heading out to Hospitality at ﻿Moto GP. Believe me..a lot of tears were shed that day..tears of joy, tears of sadness.. 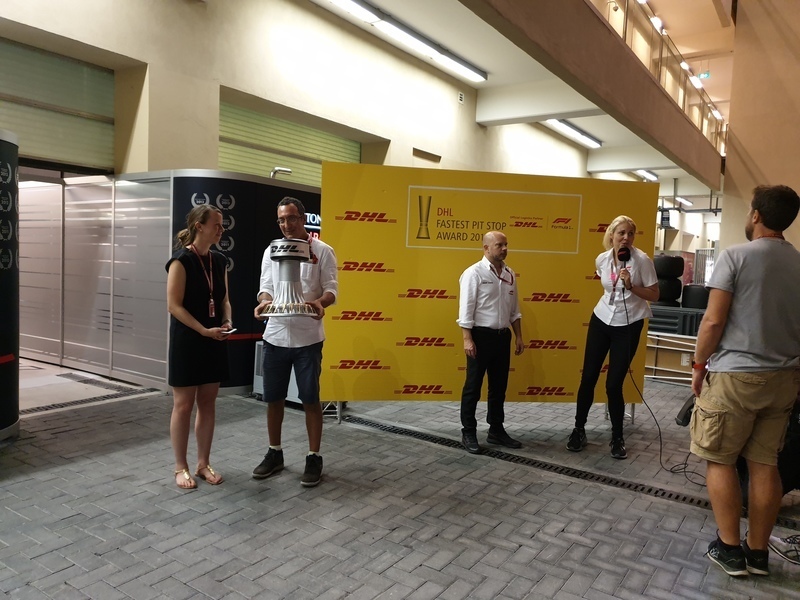 The Accolades distributed, the Thank yous said, it was time to head down to the Pits for a quick visit to the garages before the teams get down to serious business. 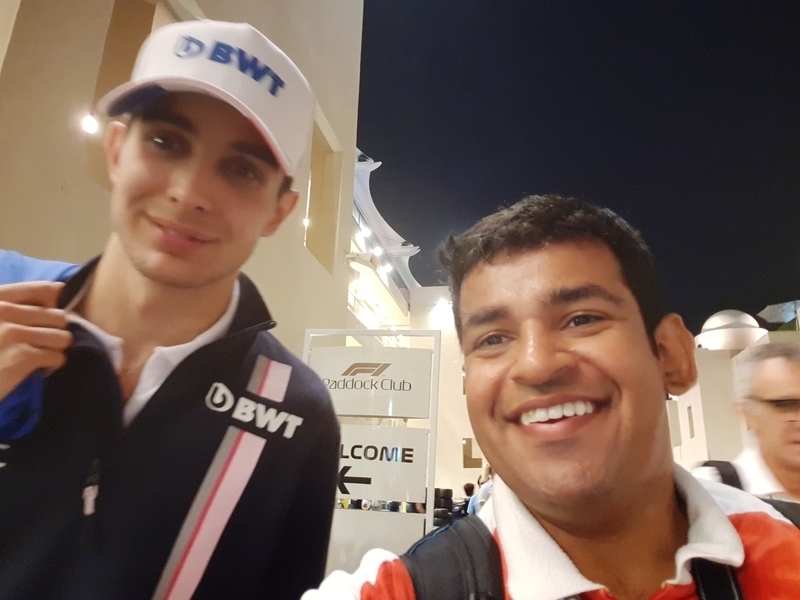 There were goodbyes between the mechanics as well..﻿Abu Dhabi ﻿tends to be an emotional race for fans and personnel alike. 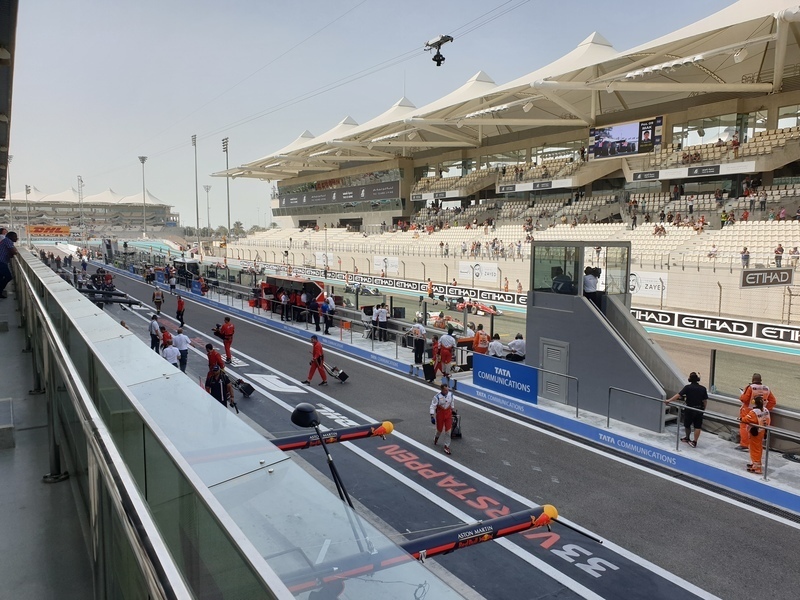 ﻿Kimi Raikkonen ﻿suffered a mechanical failure, a complete shutdown on all systems on his car and came to a halt at the start finish straight. 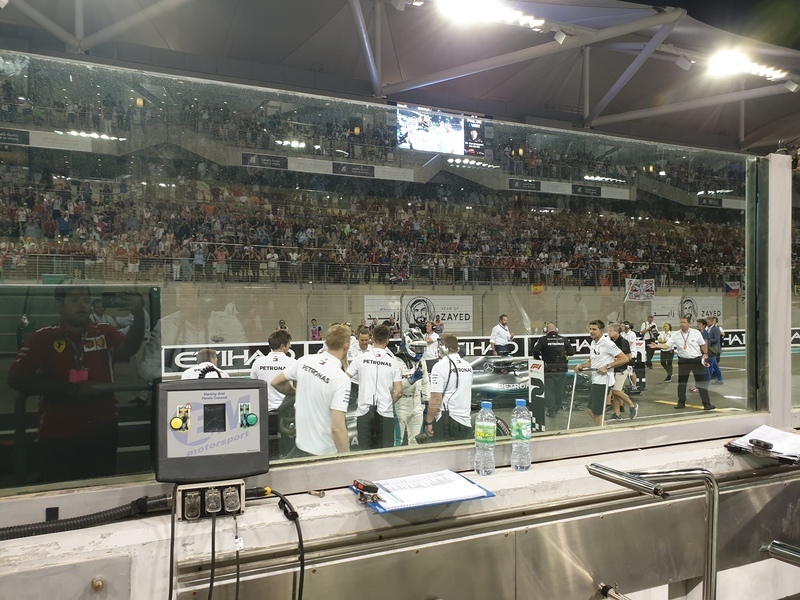 The Team ran through some system resets but to no avail. 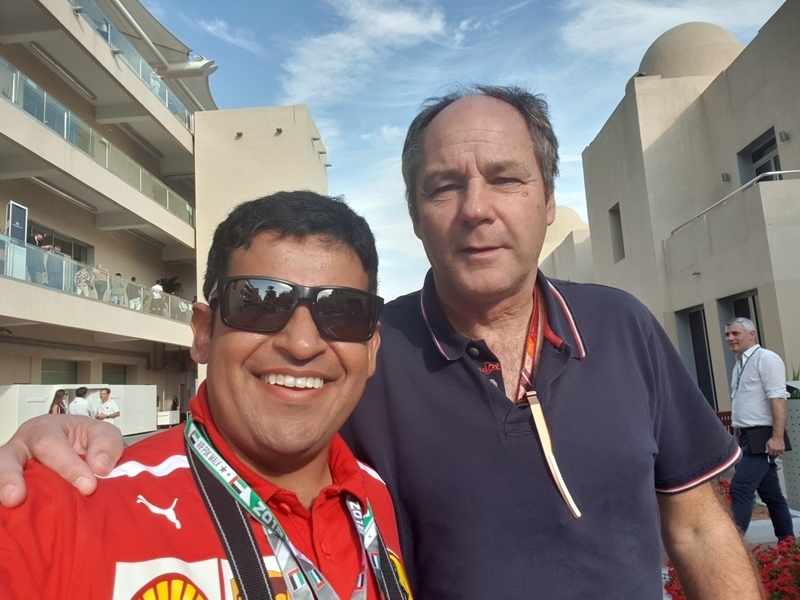 It was a disastrous end to the race, his stint with Ferrari and also left me absolutely gutted.. 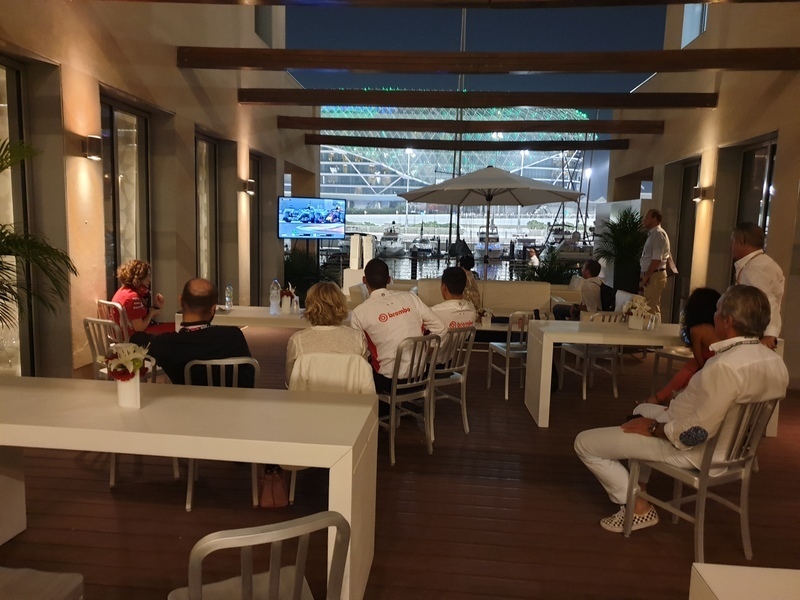 The ﻿Ferrari ﻿guests have their eyes affixed on the race proceedings. 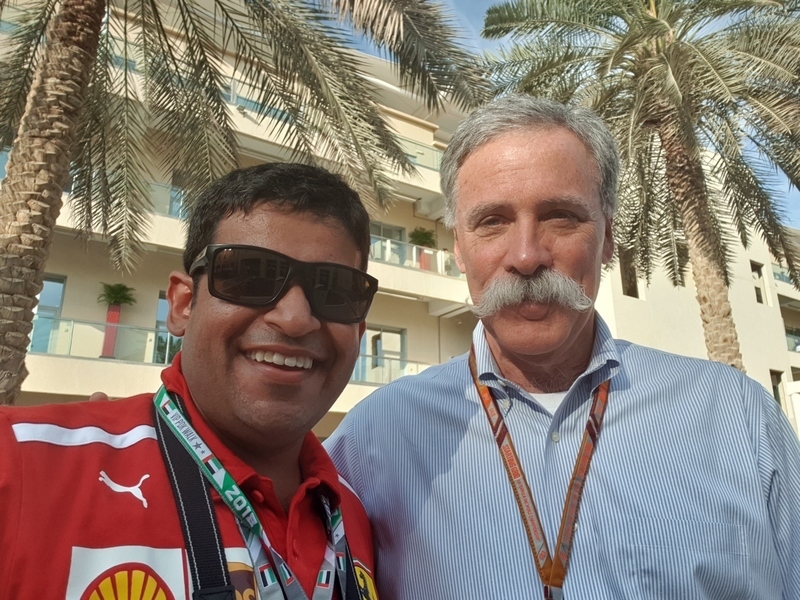 I got to meet ﻿Steve Robertson, Kimi's Manager ﻿since his ﻿Formula Days﻿..was an enlightening chat! 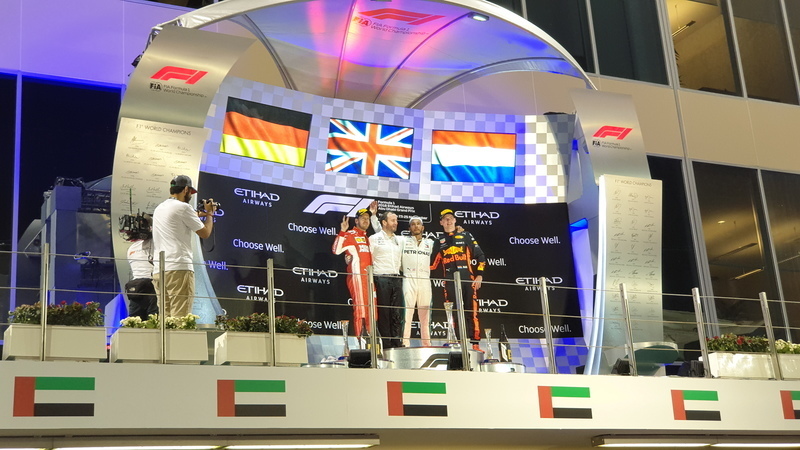 The top 3 finishers line up on Parc Ferme one last time in 2018. 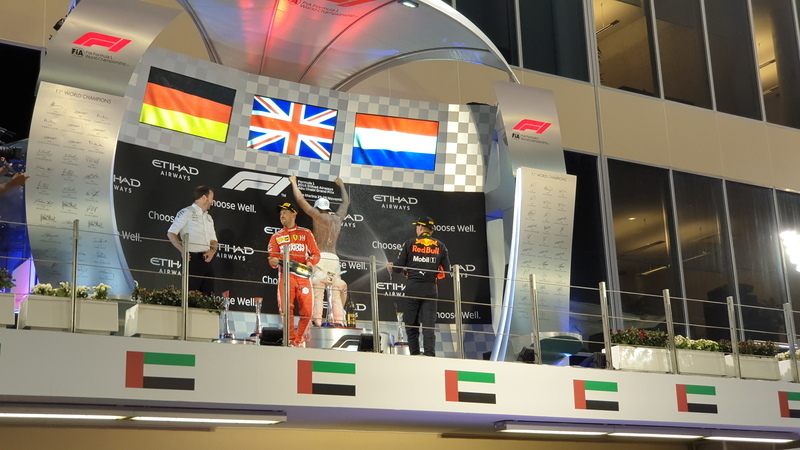 ﻿Lewis Hamilton ﻿took victory from ﻿Sebastian Vettel ﻿and ﻿Max Verstappen. 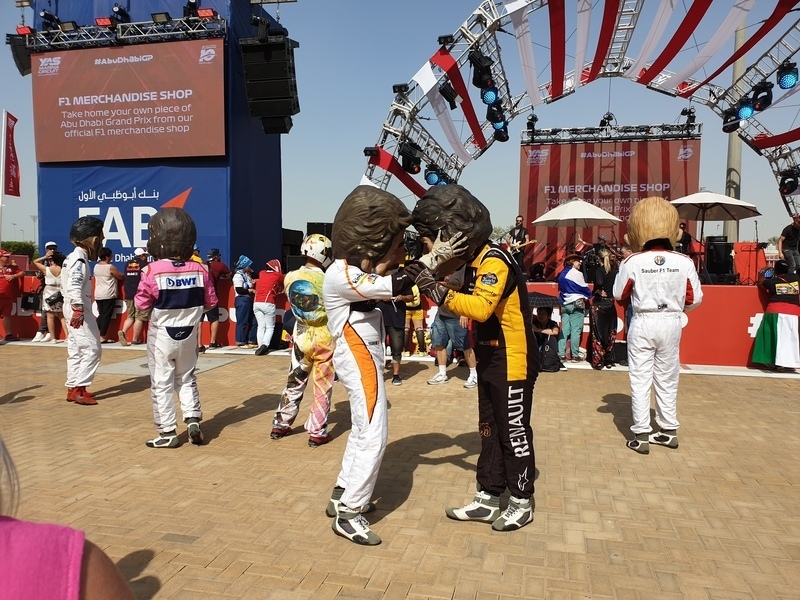 ﻿﻿Hamilton, Vettel and Alonso ﻿indulged in some doughnut display on the start finish straight after the race. Time for Champagne..oops..no its Rosewater! Photo Op time with the Top 3 finishers! 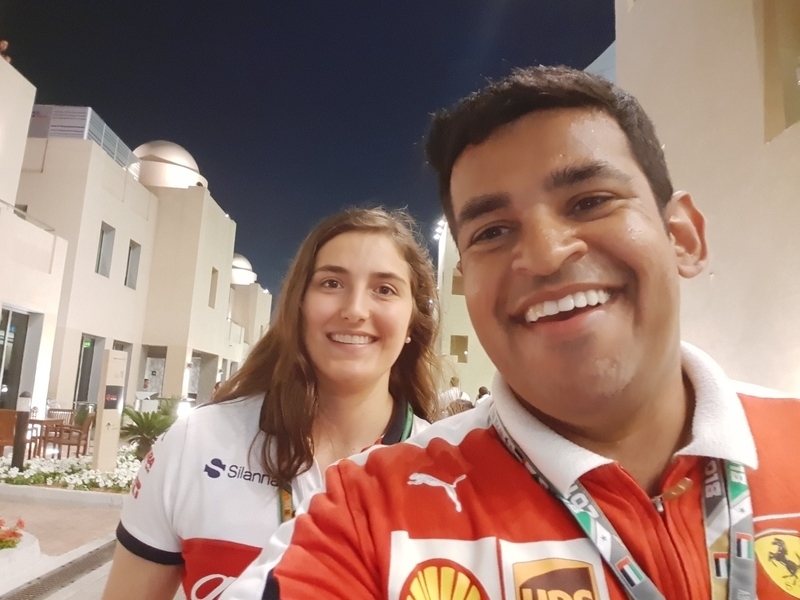 ﻿Tatiana Calderon! So nice to meet her..hope to see her next year at Alfa Romeo! 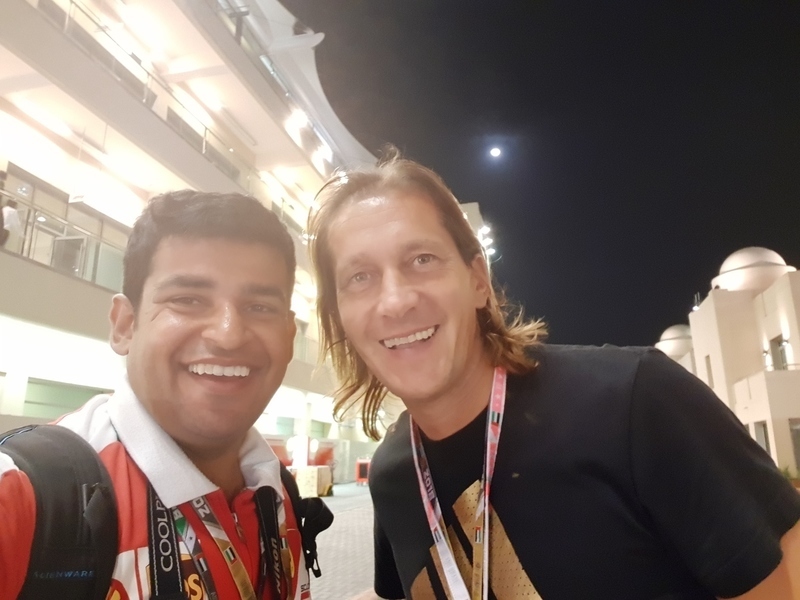 ﻿Ex-Real Madrid Footballer and Spanish Footballer Michel Salgado! ﻿Toni Vilander! 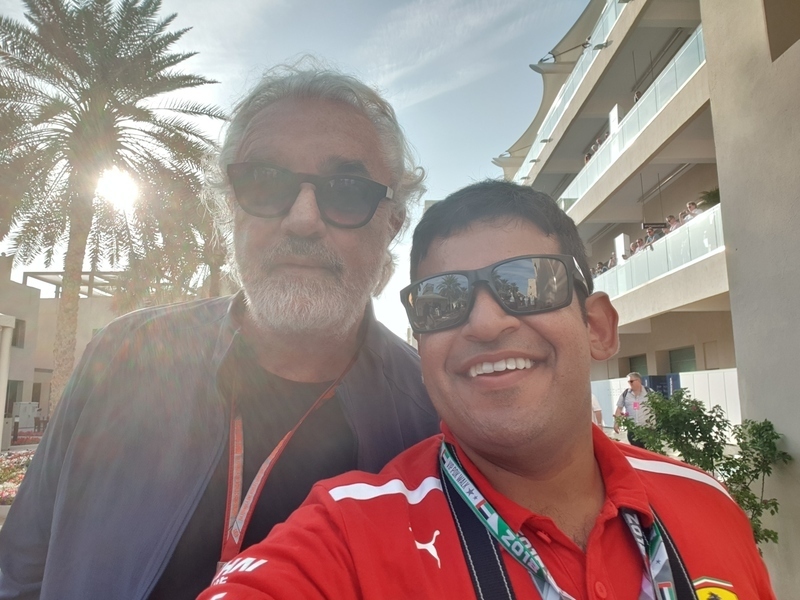 ﻿Always a pleasure to meet him. 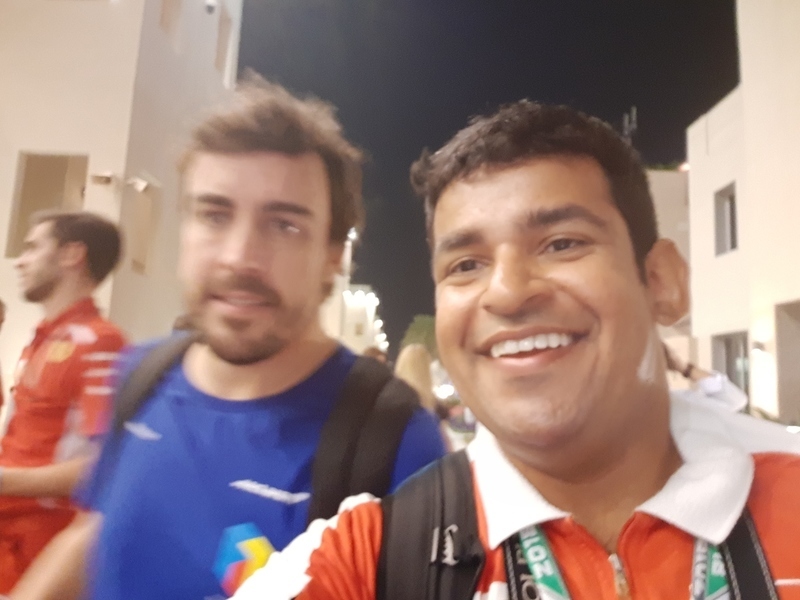 ﻿Fernando Alonso, the Matador! We will miss him in 2019. 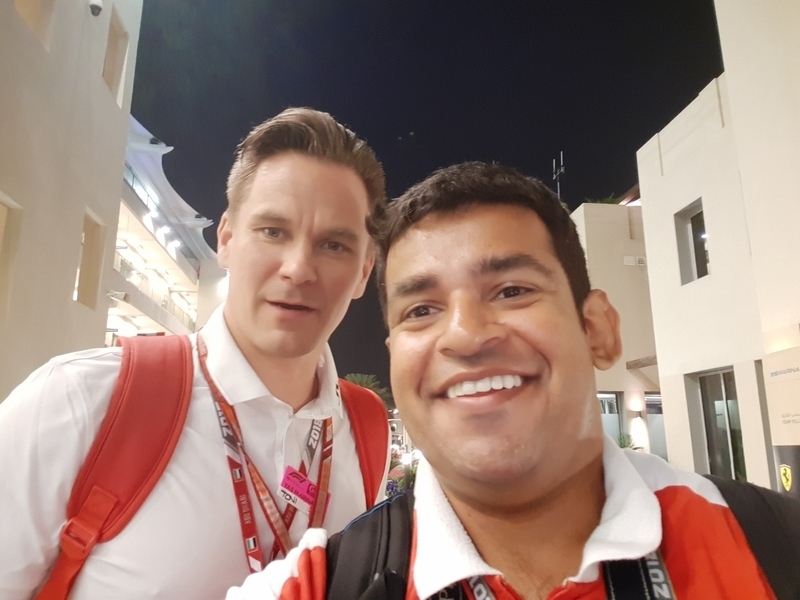 ﻿Minttu Raikkonen! Such a pleasant lady to speak to! 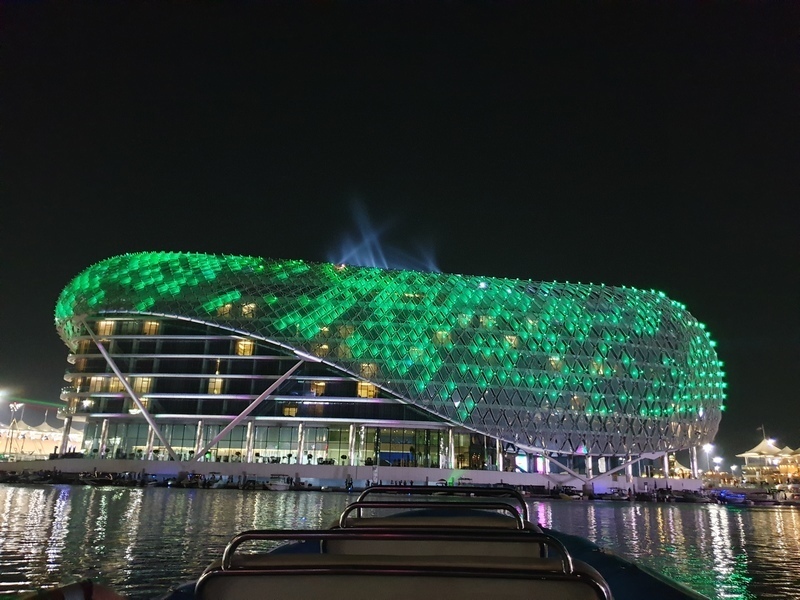 ﻿Good bye Yas Marina and Yas Island...until next time. 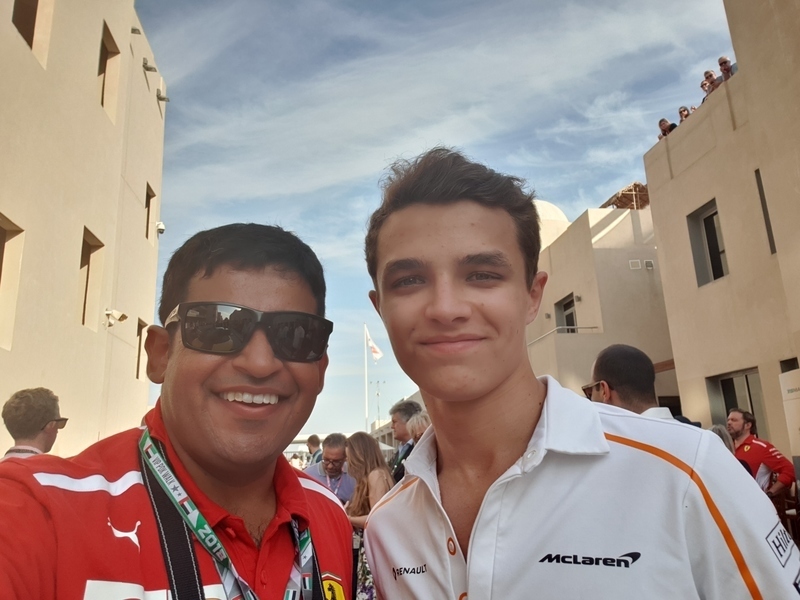 It was a great experience being at the ﻿2018 Abu Dhabi Grand Prix. 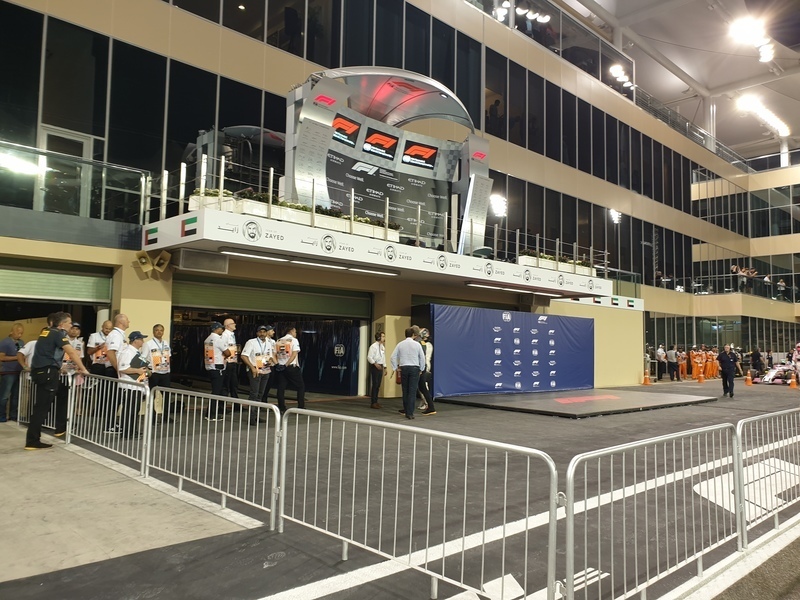 ﻿It wasn't the ideal farewell for ﻿Kimi Raikkonen ﻿with the car's mechanical failure but nonetheless he had a really decorated career at the ﻿Scuderia. 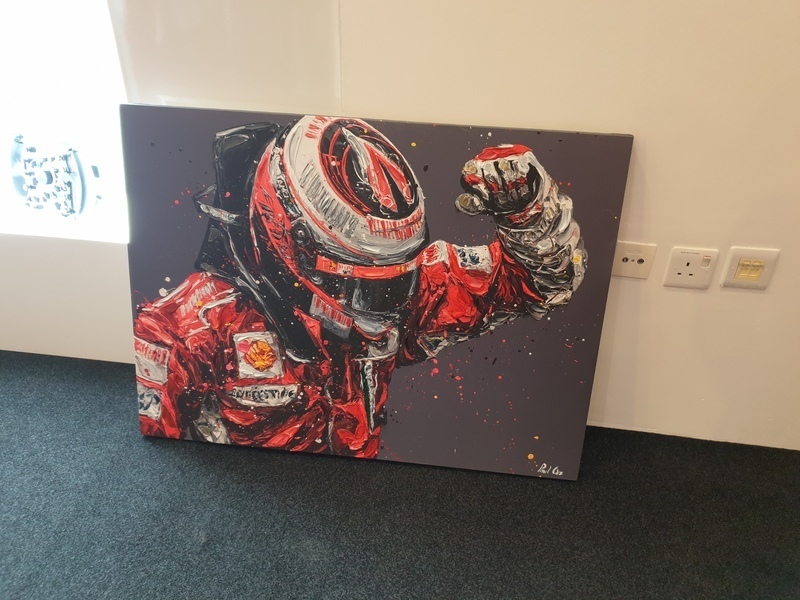 ﻿He still remains ﻿Ferrari's Last Champion! 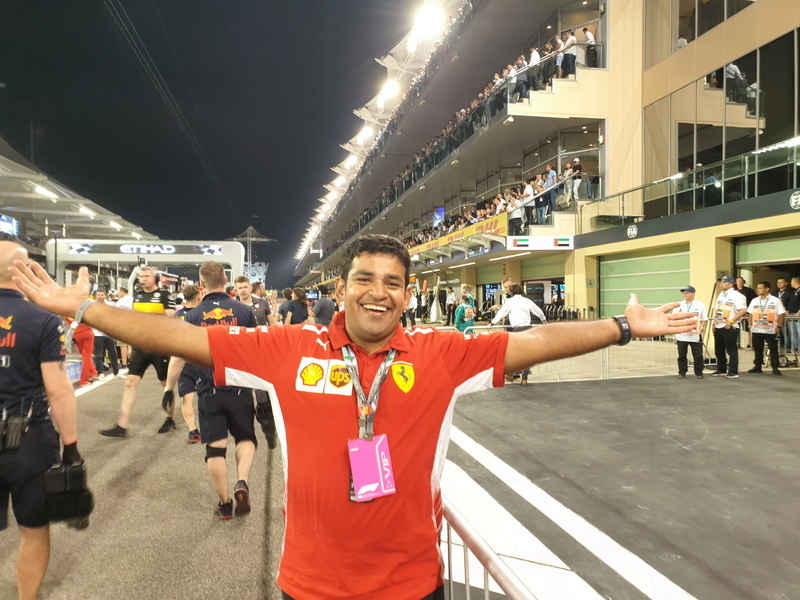 ﻿My loyalties ﻿shift to the ﻿Alfa Romeo Racing F1 Team ﻿now and I would like to thank the folks at ﻿Scuderia Ferrari ﻿from the bottom of my heart for all the love and hospitality showered upon me since the past 5 years. I have made some great friends and the experiences that I carry with me, I shall cherish until my last breath. 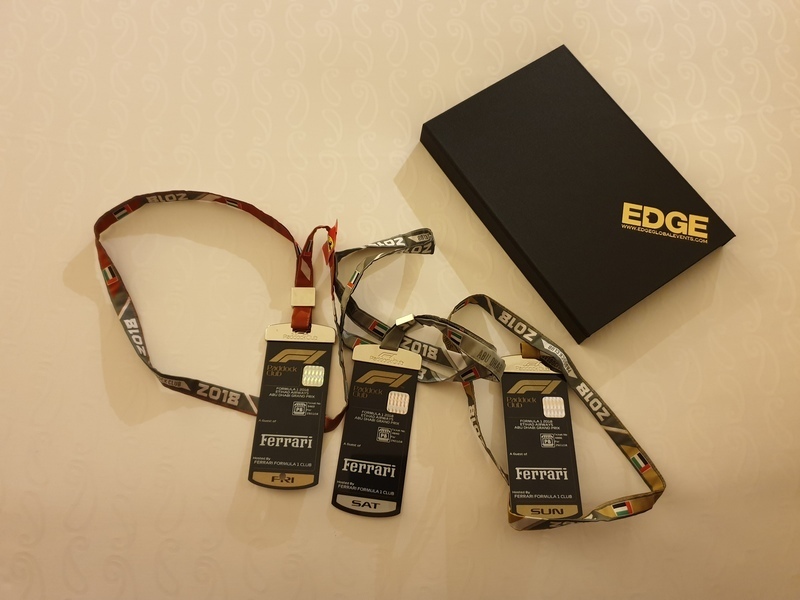 A big thank you to ﻿Edge Global Events ﻿for giving me a memorable 2018 and always ensuring a hassle free and professional experience with them. I hope to continue the association going forward. 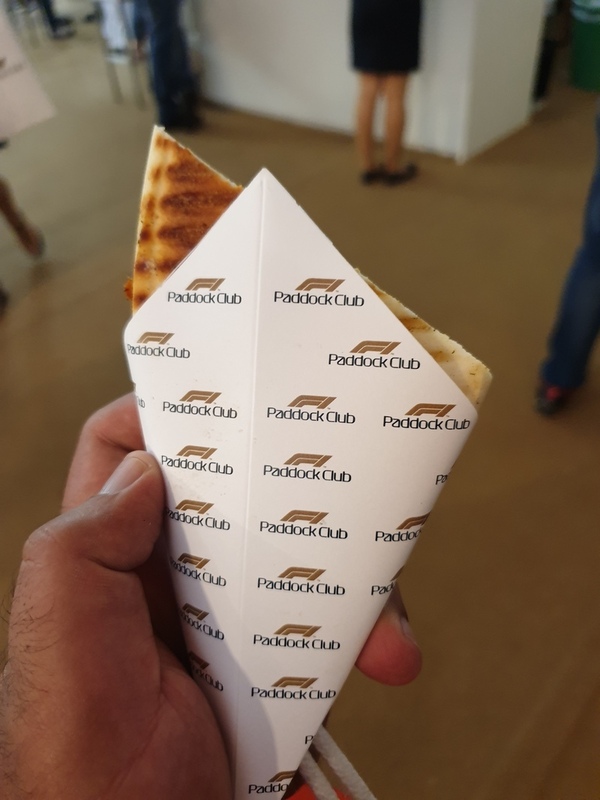 This brings me to the end of the ﻿Paddock Club Diaries ﻿in 2018. 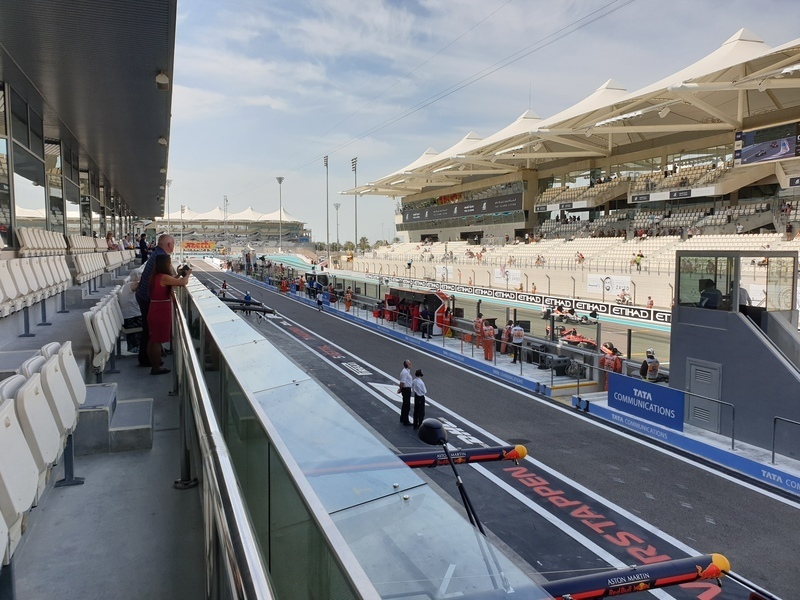 2019 promises to be equally exciting and I can't wait to get back on my travels to the races! 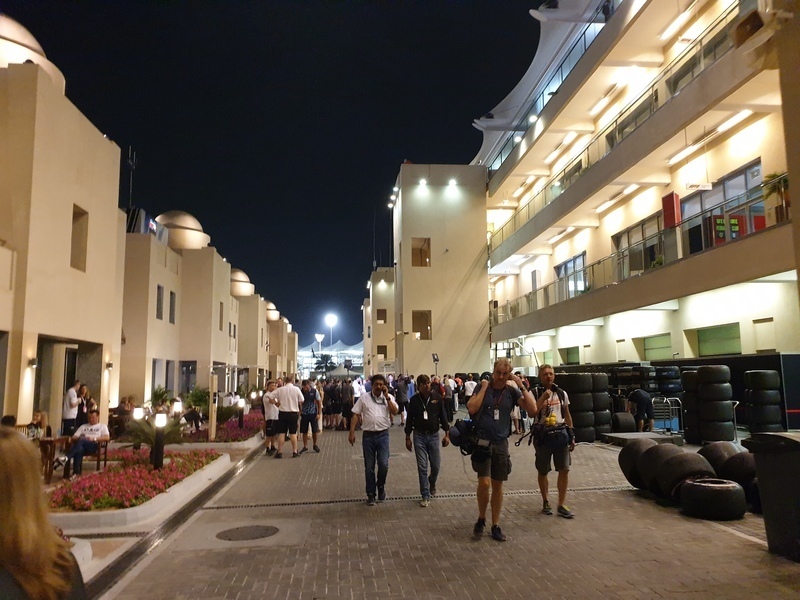 It was a relatively early start to the morning from Dubai since the Pit Lane Walk on a Saturday is always an interesting affair. Some teams indulge in pit stop practice while some spend time in setting up cars for FP3. The crowd turnout for the first pit lane walk of the day is also pretty low. 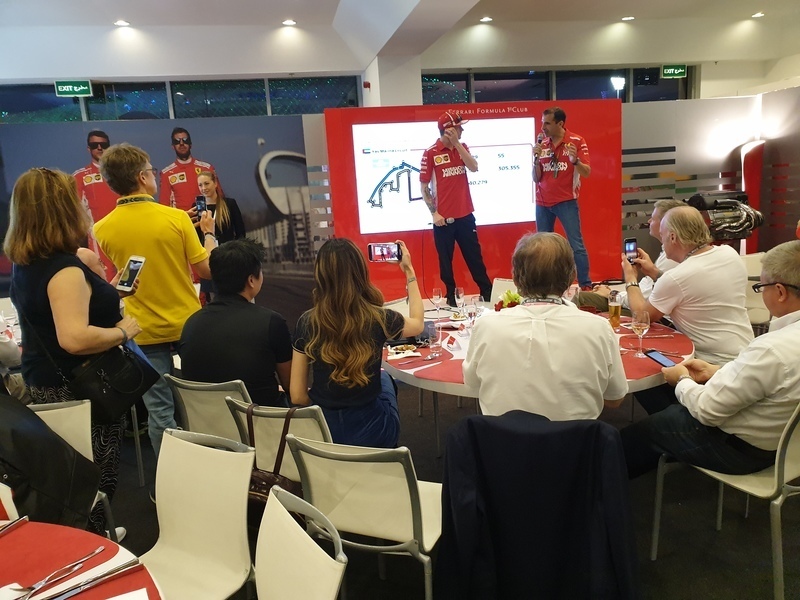 A New Addition to the Hospitality experience in the Paddock Club was the GO Karting Faceoff. 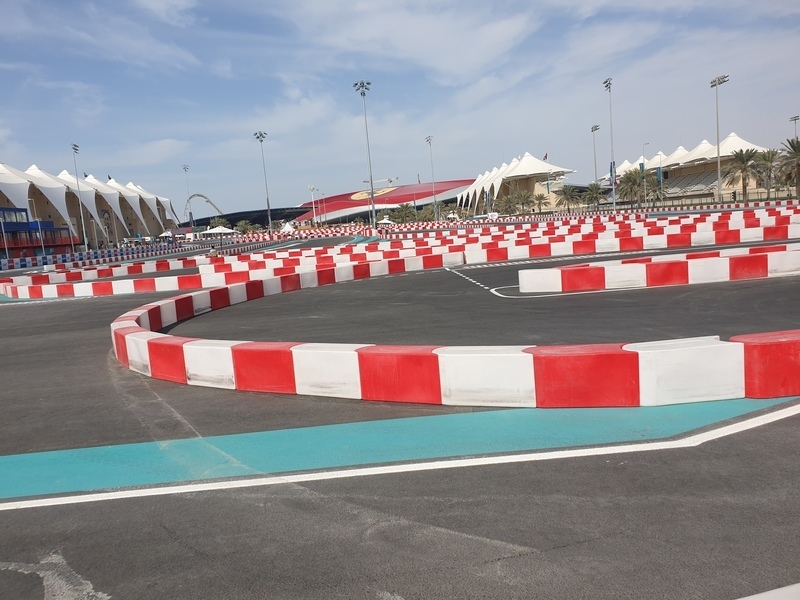 The Yas Marina Circuit has a karting track and guests could sign up for a session of karting and have a piece of racing themselves. I finished P5. I headed back in time for a hearty meal. 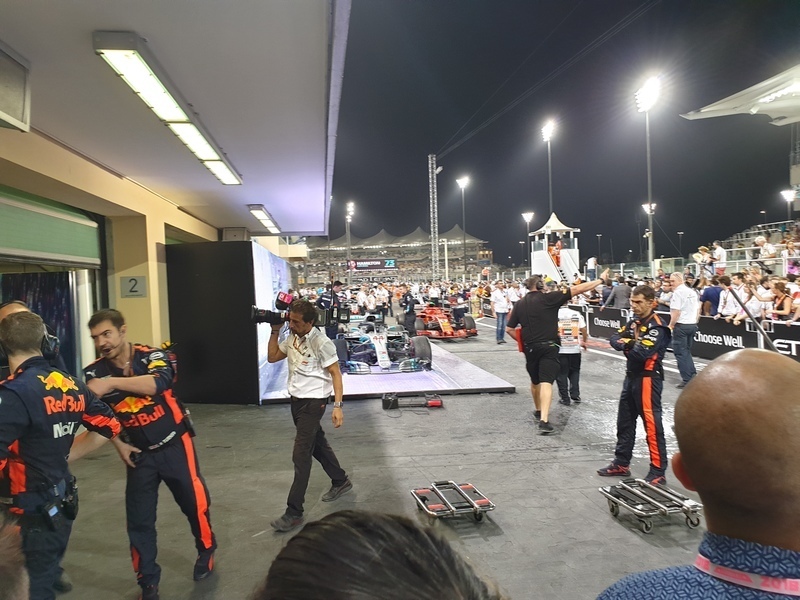 ﻿Daniel Ricciardo's stricken Red Bull ﻿returning to the pits..
﻿﻿﻿Lewis Hamilton was the fastest from Kimi Raikkonen and Sebastian Vettel. 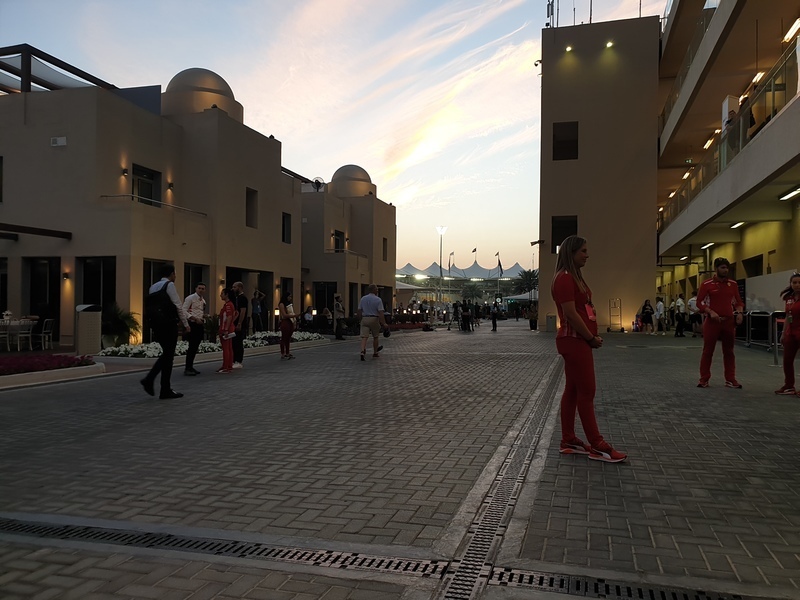 ﻿I also had the opportunity to be downstairs in the garage at the end of the session and roam the paddock after that. 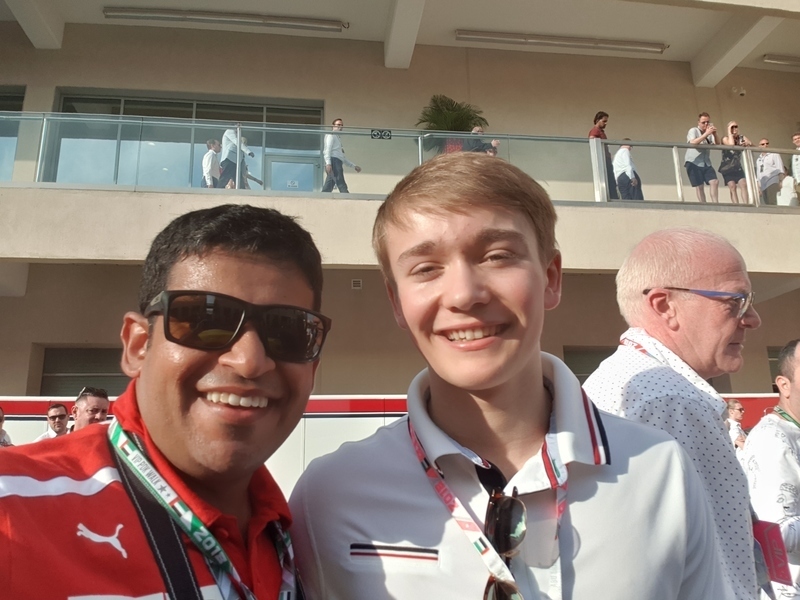 I also had the opportunity to meet people from the F1 Fraternity! 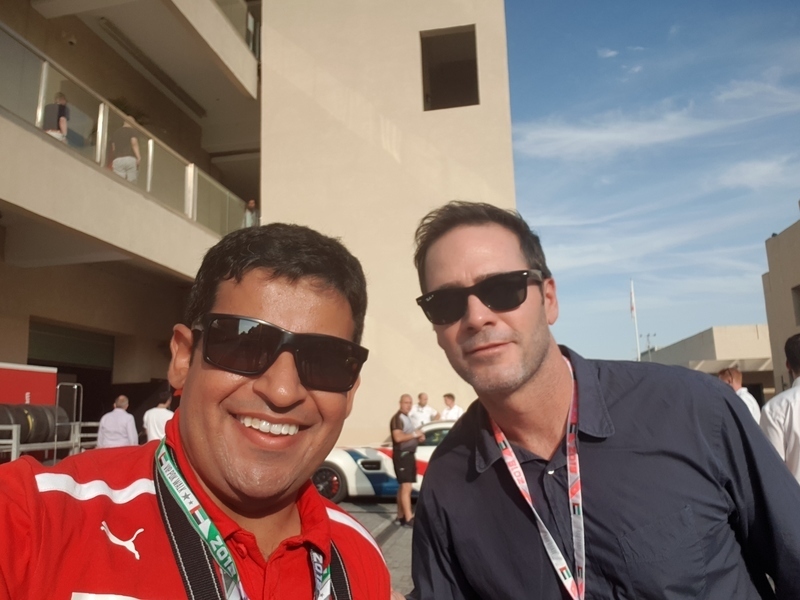 7 Time Nascar World Champion Jimmie Johnson! 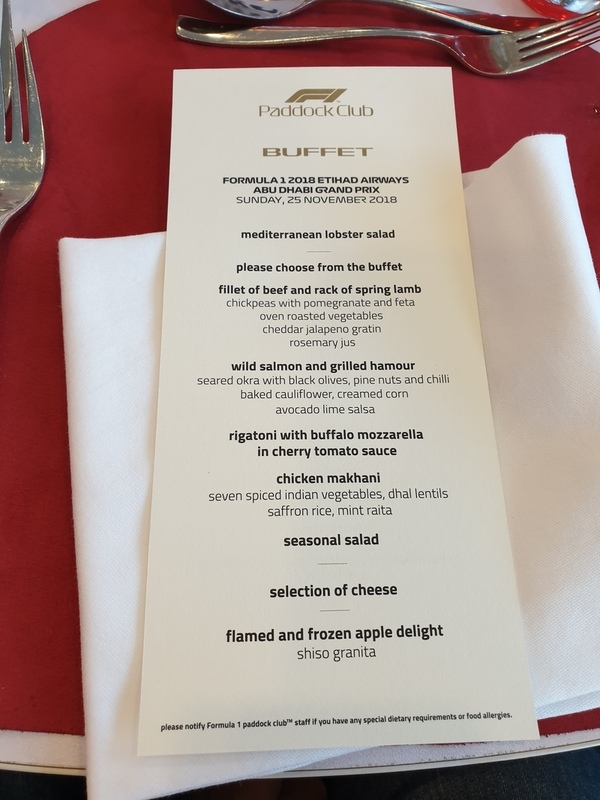 I returned to the Paddock Club and it was time to get ready for ﻿Qualifying! 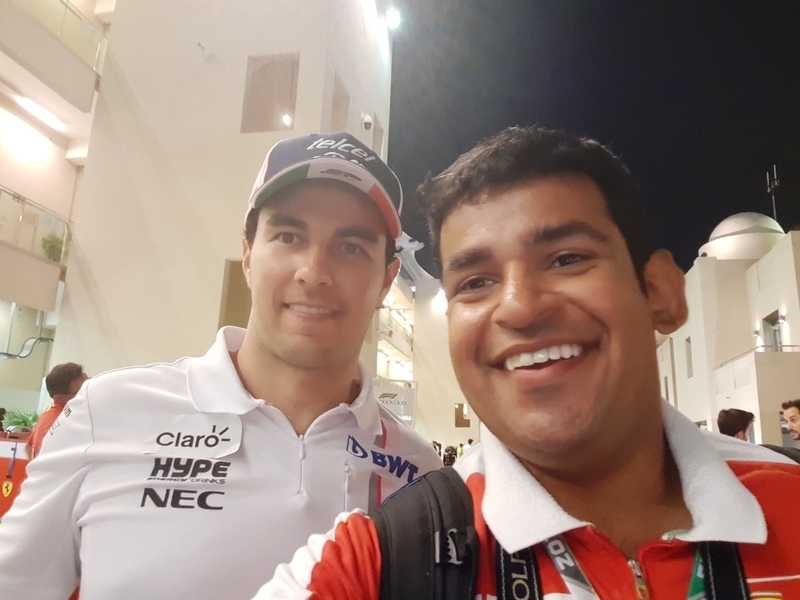 I spent a lot of time in the Garage and after Q3 had the opportunity to visit Parc Ferme! 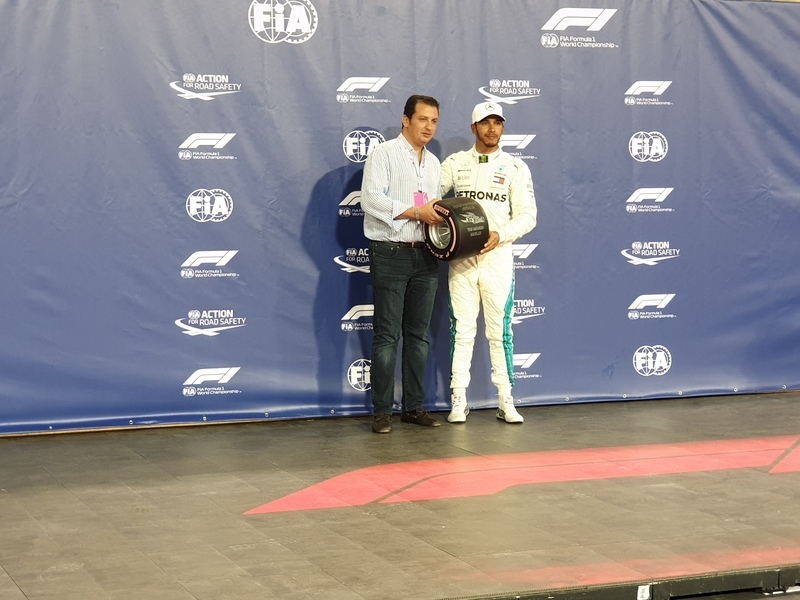 Lewis Hamilton grabbed pole from Valtteri Bottas who ensured a front row lockout for Mercedes. 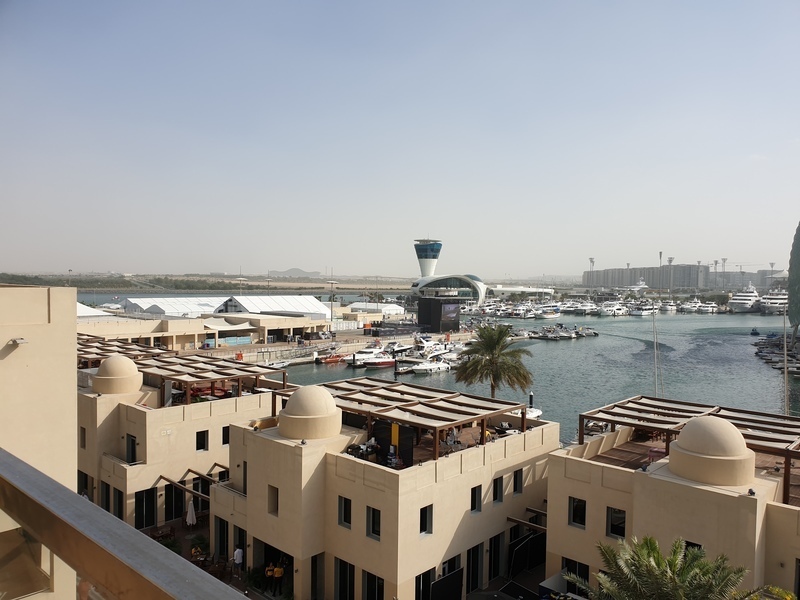 Sebastian Vettel was P3 and Kimi Raikkonen P4...not a bad place to start for the Iceman. 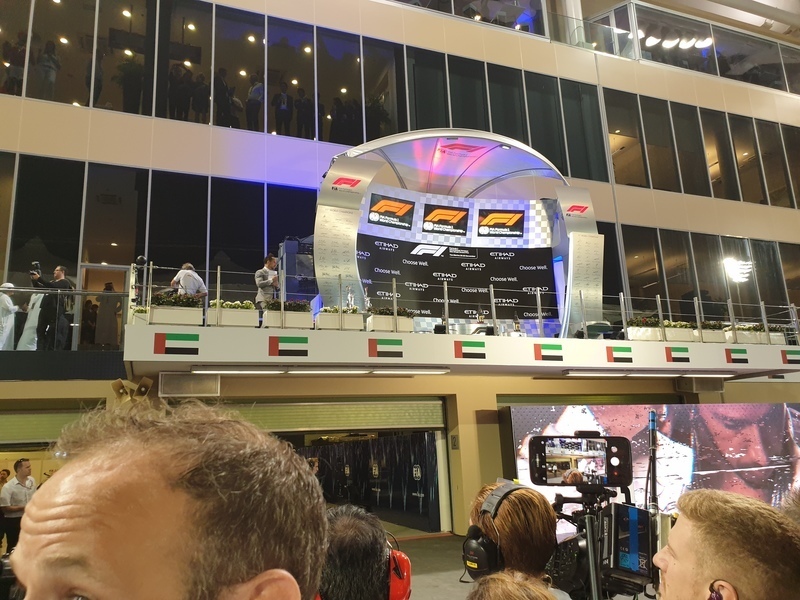 We made our way back to the Suite and the time of Kimi Raikkonen visiting the guests there was nearing! 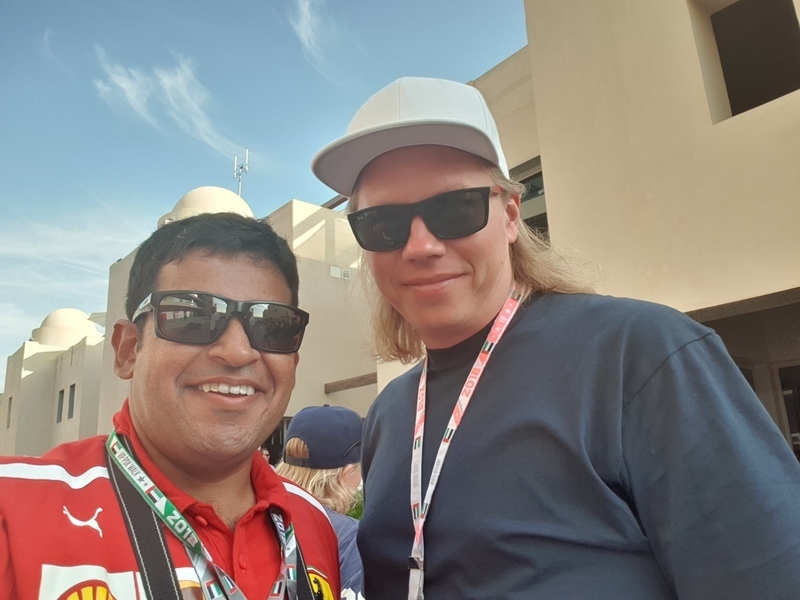 The Iceman Kimi Raikkonen is in the House! 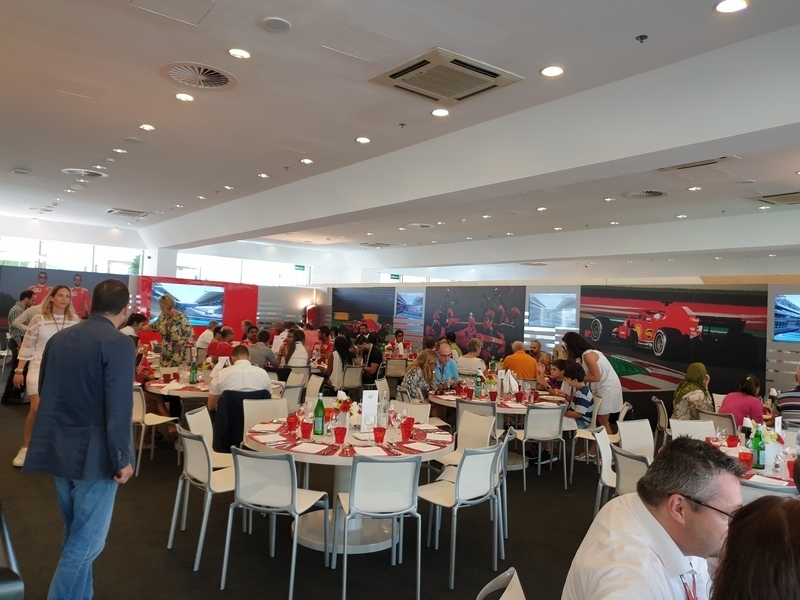 ﻿Raikkonen ﻿left to return to the comfort of the Team Building while we prepared to see the start of the ﻿Formula 2 Feature Race. 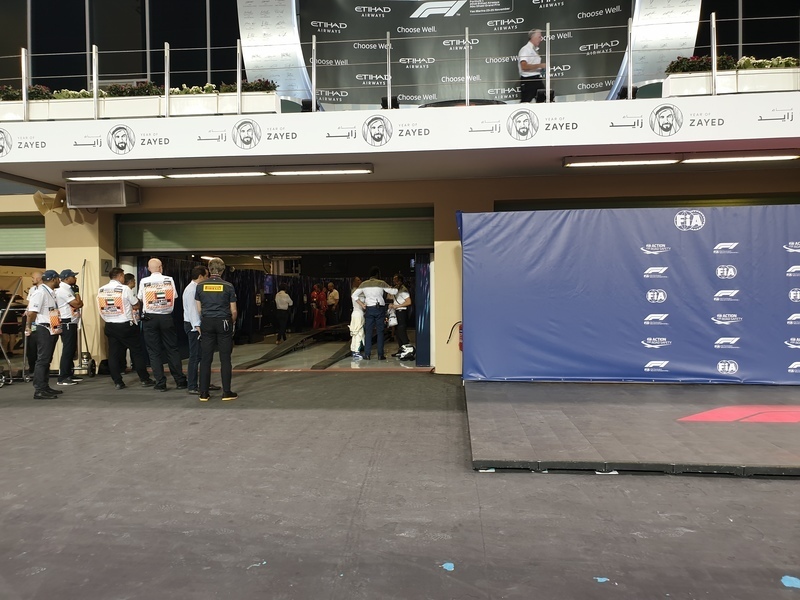 Nicolas Latifi ﻿got taken out at the start, his car badly damaged. 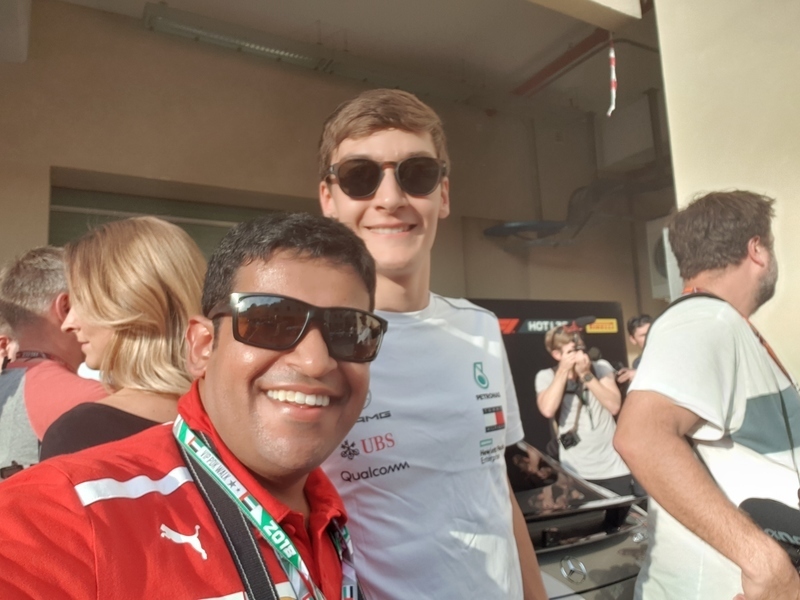 ﻿Indian Racer Arjun Maini ﻿was the driver that drove into him unfortunately. 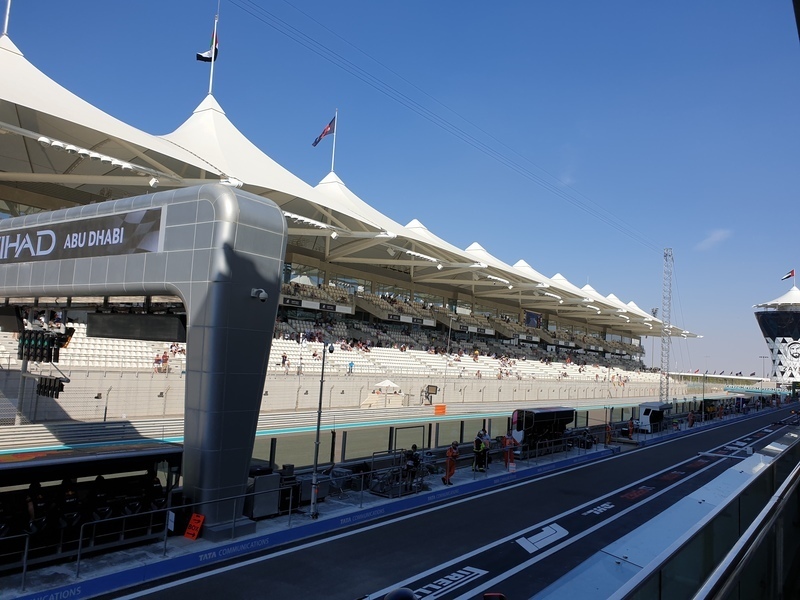 It was a great Saturday Experience at the ﻿Yas Marina Circuit ﻿and hopes of a strong end to the season by the ﻿Ferrari ﻿duo was high. 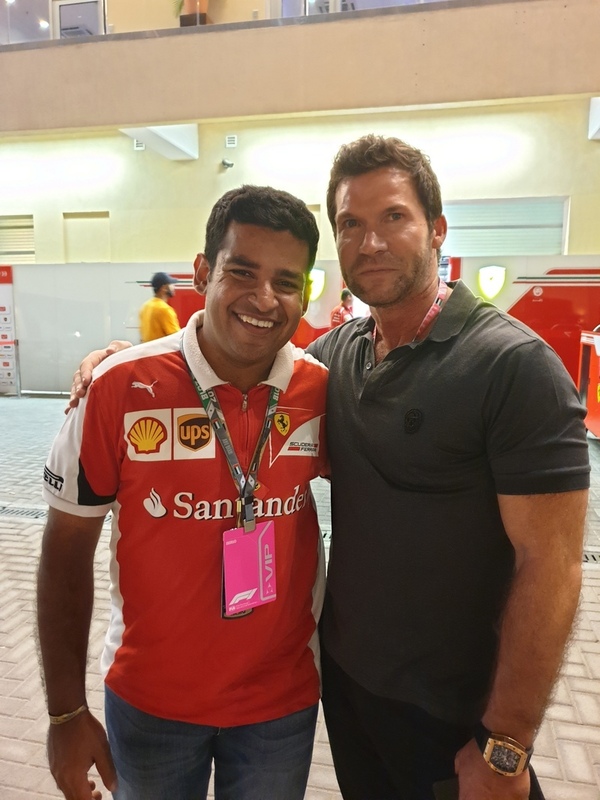 I made my way back to Dubai thankful for the opportunity and privilege of being a guest of ﻿Scuderia Ferrari F1 Team. 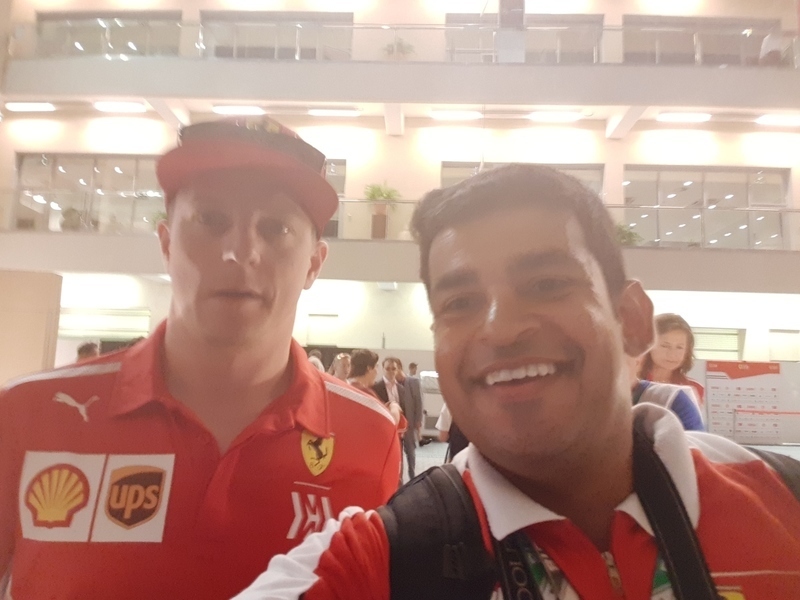 ﻿Kimi Raikkonen ﻿said Farewell to the ﻿Scuderia Ferrari F1 Team ﻿at the end of 2018 as he headed to ﻿Sauber F1 Team ﻿up until 2020. The news broke out in September and there was enough time to plan for being at the final race of the Iceman with the team. 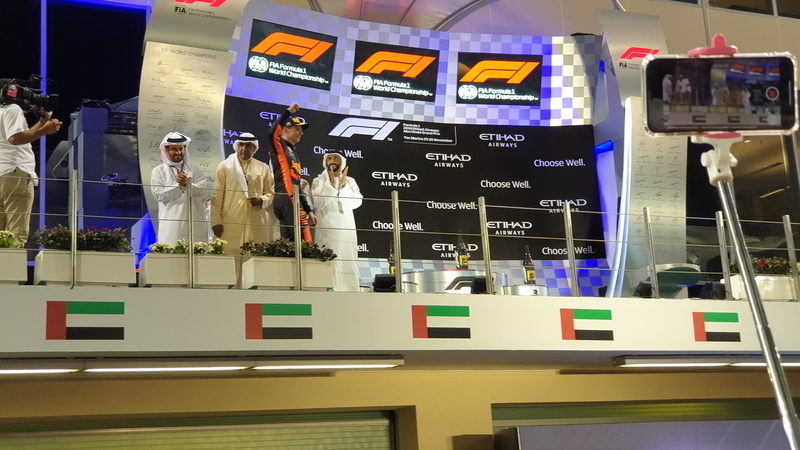 I was at ﻿Abu Dhabi ﻿when ﻿Kimi ﻿did his final race with ﻿Lotus F1 ﻿and would repeat the feat again. Here is a quick look at how the Friday experience panned out. 2 Cars from the Pirelli Hot Laps experience. 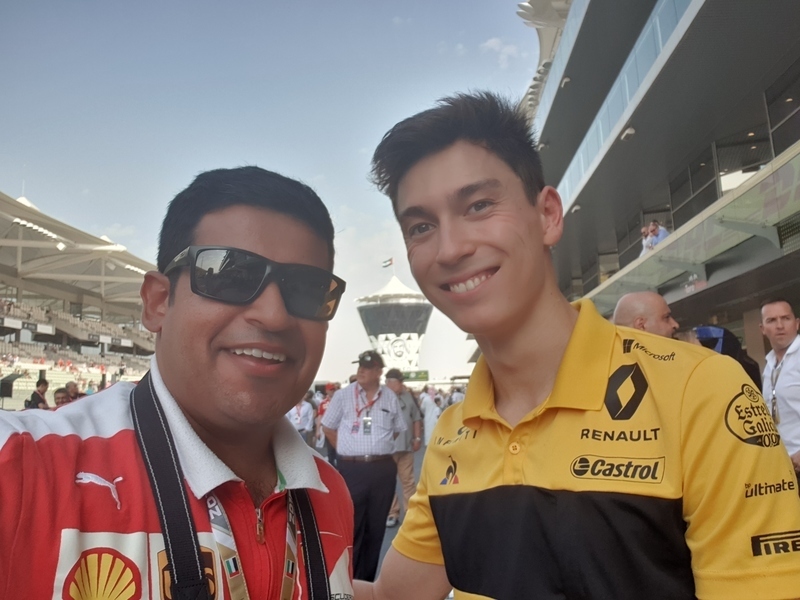 ﻿A man spent 25000 GBP for a Hot Laps Experience with Max Verstappen on Thursday! Wow! The first order of the day was Free Practice 1.